Dropbox is a great way to post an image quickly on a forum or as free hosting for your low traffic website, but there are a few things to know. Whether to reduce your website bandwidth or for some other reasons, you may want to host your website assets with CDN. So here, Dropbox will also works for you as a CDN and the only thing you need to do is some simple tweaks. Haven’t join Dropbox yet? Sign up now with https://db.tt/vocH7o0j link and install Dropbox on your desktop computer, you’ll get extra 500MB of bonus space. There’re various way of getting share link to a file in a Dropbox, follow one of them as your comfort. Install the Dropbox desktop application on your computer (if you haven’t already). 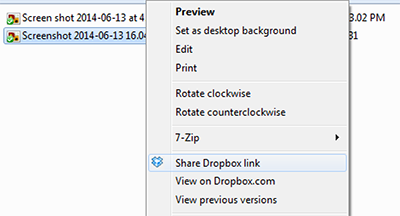 Right-click on the file to open its contextual menu and select Share Dropbox link. The link will be copied and you can immediately paste it anywhere. Share link from the Dropbox contextual menu. Sign in to the Dropbox website and find the file or folder you’d like to link to. Hover the cursor over the file or folder and click the blue Share button that appears. A pop-up window will appear with the link. Copy the link to file and you can immediately paste it anywhere. After getting a public shared link path to a image file, if you try to visit it you will get preview on Dropbox site and image hosting doesn’t work by pasting this link. So to fix this, all you need is to change the shared link path domain name with new one. Just replace www.dropbox.com with dl.dropboxusercontent.com and this will serve actual file instead of getting previewed in a site. Tip: To get direct download link to a file uploaded on Dropbox you can use ?dl=1 as a query parameter in your URL. And to just bypass the preview page on Dropbox you can use use ?raw=1. Dropbox, the Dropbox logo are trademarks of Dropbox Inc., registered in the U.S. and other countries. Is there a bandwidth limit for Dropbox public links? “There is a hard limit of 20GB/day for Basic (free) accounts and 200GB/day for paid accounts to all of your links together, after which they’re temporarily disabled, and those who try to access them will see an error page instead of your files,” Dropbox explains. Lets compare, you have images hosted on Dropbox which is around 250KB. That means images all together should have less than 80K impressions in a day for you to stay within the Dropbox traffic limits. And if another site hotlink to your static images, it may use up your “free bandwidth” quota even sooner. Note that this is for share links, not for access via the API.